When it comes to buying jewelry, a diamond is more preferred by women because most women frantically love diamonds. Diamond jewelry can go well with all kinds of apparel, its unique beauty offers a gorgeous look to the woman. Buying diamond jewelry would be a daunting task. Since diamonds are very expensive, you should be thoughtful and alert while purchasing them. 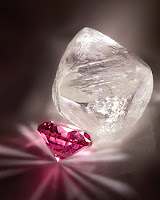 You must be able to recognize the difference between real diamonds and fake diamonds, so that you won't be deceived. You can identify fake or real diamond by using a diamond tester. It is an electronic tester that can check all types of diamonds except the moissanite stone. Select a trustworthy jeweler while purchasing diamond. While buying a diamond, always ask for its certification, obtained from a recognized diamond grading authority. Always check the diamond for scratches, scuffs or other kind of damage under a magnifying glass.